Tricky & Titch combines expressive and emotive design with soft premium combed cottons, careful construction and contemporary style. The style attempts to be reflective of the special little people we love so much. The result, they hope, is a brand that is smart, contemporary, confident and most importantly, fun. Tricky & Titch manufactures and distributes its clothing out of Vancouver Canada. They support and understand the importance of local North American manufacturing. 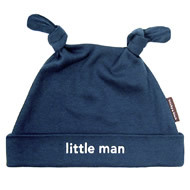 Their infant apparel can be found in fine boutiques throughout North America and Europe.